Northwestern hosted voting locations on its Evanston campus for the Evanston mayoral primary vote. Steve Hagerty and Mark Tendam were elected to continue in the general election. As Evanston Mayor Elizabeth Tisdahl approaches the end of her term, some Northwestern students are mobilizing to elect the city’s next mayor. Ross Krasner, Associated Student Government’s vice president for community relations, said he voted in both the mayoral and aldermanic elections for candidates who would be most willing to engage with Northwestern students. Because municipal politics more closely affects students than state or federal politics, Krasner said he was eager to work with the next mayor and City Council on issues related to Northwestern. Of the five candidates running for mayor — businessman Steve Hagerty, Ald. Brian Miller (6th), Ald. 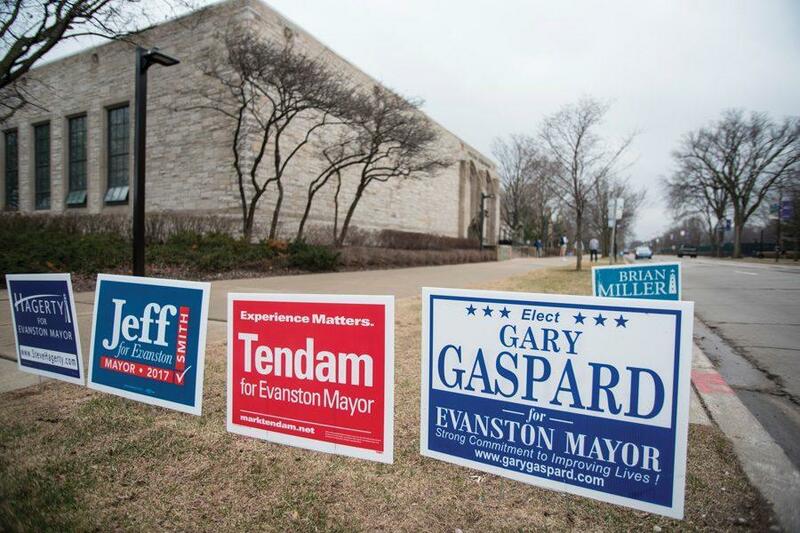 Mark Tendam (9th), former Evanston Township supervisor Gary Gaspard and lawyer Jeff Smith (Weinberg ’77) — Hagerty and Tendam will go on to the general election in April following a primary held Tuesday. This year is the first contested Evanston mayoral election since 2009, when Tisdahl was first elected. Tuesday’s mayoral primary was the first held in the city in two decades and the second in city history. The primary came as a surprise to many, and was announced in December after all five candidates had filed their candidacy. SESP sophomore Michael Deneroff said he changed his voter registration from his home state Michigan to Illinois to be able to vote in the mayoral election. Deneroff said he tries to participate in politics at all levels, but the best way to get civically engaged is to start at municipal politics. Some mayoral candidates expressed interest in engaging with students. During a debate hosted by The Daily and NU Political Union in February, Hagerty said he would want to speak to freshmen during Wildcat Welcome about Evanston and would advocate for student causes, saying social justice often begins at college campuses. NU Votes, an initiative run by the Center for Civic Engagement to encourage student voter registration, launched new resources to help students vote in the mayoral election. Although the primary’s late announcement caused NU Votes to “scramble” to get voting information out to students, the center had created online informational guides to help students determine how to register and where to vote, said Rob Donahue, the center’s associate director. Northwestern students, who have tended in the past not to engage in Evanston politics except when other students or professors ran for office, could sway the election, University archivist Kevin Leonard told The Daily in January. Students represent about a fifth of Evanston’s adult population. Though students have historically engaged more with national politics, Donahue said college is an optimal time to teach students civic engagement at the local level, too. Since NU Votes first launched five years ago, staffers have seen voter registration among eligible freshmen rise from about 25 percent to more than 90 percent, Donahue said.